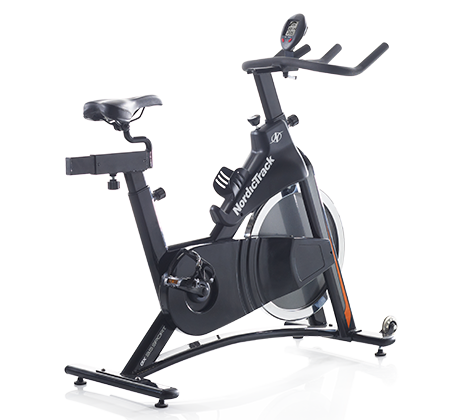 The GX 3.5 Sport is an affordably priced, entry-level exercise bike from NordicTrack. Designed to offer you a realistic cycling experience, the bike features a heavy 40 lb flywheel, adjustable resistance, seat and handlebars, and a backlit LCD display. The backlit LCD display helps you keep track of time, speed, and watts during your workouts and displays the data in an easy-to-read format. Check out the GX3.5 Sport on Sale Now at the NordicTrack Store! The very first thing you notice about the GX 3.5 is its size. With a compact 49” x 18.5” footprint, it can fit into the smallest of spaces. It comes with a pair of front-mounted transport wheels, so you will find it easy to move it around. It is made with commercial grade steel and treated with corrosion inhibitors for durability. The 3.5 is engineered similar to a road bike and features a 40-pound flywheel and a chain drive system to offer you a realistic biking experience. The resistance is very quiet and smooth and can be manually adjusted by simply twisting a knob. The quick-stop braking system allows you to bring your workout to a halt instantly. The handlebars are ergonomically designed to reduce fatigue and fitted with a non-slip material for better grip. For a beginner’s bike, the GX 3.5 scores high in terms of adjustability. The padded saddle as well as the handlebars can be adjusted horizontally and vertically, which makes it easier for you to find your optimum seating and riding position irrespective of your height. Similarly, the foot pedals are fitted with adjustable foot straps on one side and toe cages on the other. You can use the foot straps to keep your feet in place during your workouts. You can also adjust the straps to reposition your feet any time you want. If you flip the pedals over, you can find the toe cages, which are designed for improved stability during high-speed, high-intensity workouts. The backlit LCD display shows your work data (speed, time, and watts) in an easy to read format. The bike is made with high quality steel and is surprisingly sturdy. It has a user weight capacity of 250 pounds, which is standard for an entry level bike. It features a built-in water bottle holder as well. The GX 3.5 lacks a heart rate monitor, which is essential if you want to improve the efficiency of your workouts and get better results. It comes with a 90-day parts and labor warranty, which is pretty short. But at this price point, it is hard to find too many bikes with longer warranty and additional features. The GX 3.5 Sport is a neat little entry-level bike from NordicTrack. It is priced extremely low and is well within most people’s budget. It features a heavy flywheel and offers a much better cycling experience than most other bikes in this price range. It is fully adjustable and designed to help you find your perfect riding position. The lack of a pulse monitor and the short parts and labor warranty are the only downsides. If you can afford to look past the steep increase in price tag, you can opt for the GX 5.5, which is the upgraded version of the 3.5 and features a heavier flywheel, increased user weight capacity, heart rate monitor, and longer warranty. On the whole, the GX 3.5 is definitely one of the better bikes you can buy for under $500.